Sometimes a stumbling block looms before you. Worry not. Here's how to make it into a stepping stone. When I was 29 years old, I started an Information Technology consulting firm. We were helping Fortune 1000 companies convert their systems to Microsoft Windows. It was 1991 and there wasn't much Windows programming expertise in the marketplace. I made over 500 cold calls in order to schedule only 35 meetings. And at each of those 35 meetings I was rejected. Yes, at every single one. Don't Miss Christine Comaford-Lynch's Upcoming WITI Teleclasses! If you are feeling the stress of more work and less time and support to do it, you are not alone. In today's warp-speed and tumultuous work environment, productivity expectations are extraordinarily high and climbing. Under such strain, it is easy to keep your head down and eyes on your work, instead of scanning the horizon for important shifts and changes. June 26, 2007 • Fort Lauderdale, Florida • Register Now! WITI SAVVY Magazine: Ad Space Closes Next Friday, June 29! WITI SAVVY features in-depth content on the issues facing professional tech-savvy women. We aim to inspire, support and promote the advancement of women both personally and professionally and help them achieve unimagined possibilities through technological leadership and economic prosperity. For rates and complete details, call (818) 788-9484 or email [email protected]. Prime Brokerage Services IT provides technology solutions to the Prime Brokerage and Equity Finance Businesses, managing a large ($115m+) portfolio of change programmes and run-the-bank activities, and providing a wide range of system solutions. The group is represented globally and consists of over 600 staff, 200+ based across New Jersey, New York and Stamford. The successful candidate will report both to the Head of the Prime Brokerage Services IT function and the Head of the Equities IT Chief of Staff Office. They will have responsibility for providing Chief of Staff support globally to the Head of the Prime Brokerage Services IT function and his direct reports and managing the global Programme Management Office team. Furthermore they will need to take direction and to work in close partnership from the Equities IT Chief of Staff Office. 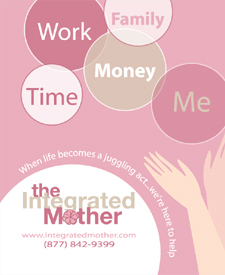 The Integrated Mother is a coaching and training company committed to showing working moms how to thrive in their careers, raise great kids and love life - without guilt! The company specializes in helping mothers navigate career moves that support their desired work/life, whether that means preparing for a promotion, negotiating flexible work or starting a business.